“We park our car in the alley on the south side of the 1300 block of Fairmont. 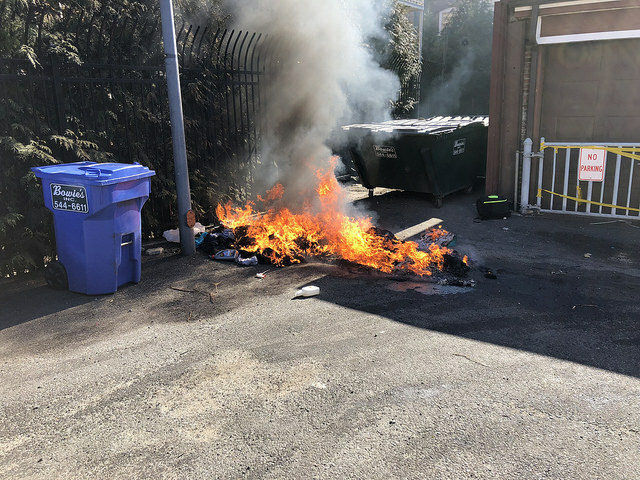 When we left to run some errands around 9:00 am Saturday morning, there was a bunch of men’s clothes dumped in a pile at the end of the alley. When we returned around noon, the pile of clothes was on fire. I called 9-1-1 but Engine 4 was already on it way. I back out and went to take some pictures. It was a little higher when I first saw it, but the attached picture show the gist. Engine 4 had a little trouble getting into the alley but the firefighters dragged the hose and put out the fire without incident.